When is a barrow not a barrow? Why, when it’s ‘Knatt a Barrow’ of course and this Knatta Barrow sits upon its own hill – Knattaburrow Hill at an altitude of 450 metres. 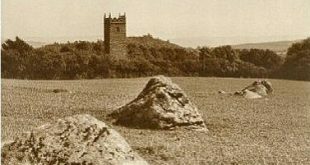 Here we see some typical Dartmoor confusion as various topographical writers refer to a burrow as opposed to a barrow, either way its the same landmark feature. Just to add a bit more mystification, there is also another cairn known as Knattaborough which can be found some 27 kilometres to the north(ish) of Knatta Barrow. There are several place-names on Dartmoor that either begin with the element Knatta or Gnat and it is possible that there is an Old English word that connects them – gnæt. The modern-day translation of this word is ‘gnat’ or ‘midge’, Clarke-Hall, p.157, so could it be that all these names refer to a landscape feature that was renown for gnat or midge infestations. If so the Knatta Barrow would be the ‘barrow with midges/gnats? Today Knatta Barrow is a listed as a scheduled monument under the Ancient Monuments and Archaeological Areas Act of 1979 – listing number 1002659. As with most Dartmoor prehistoric cairns the builders certainly had an appreciation of moorland views and this one is no exception as it affords some excellent vistas of the southern moor. There is some slight confusion as to exactly what type of cairn Knatta Barrow originally was. There are two options; a ring cairn that had another central cairn added or one where the ring of the cairn was a later addition. Either way the central cairn has a diameter of 20 metres and stands at a height of 1.7 metres. There is a possibility that there may have been a flat or platform top to the cairn which would classify it as a ‘platform cairn’.. Thanks to the great deal of modern disturbance this suggestion cannot be confirmed. The damage may of occurred a long time ago by tomb raiders looking for ‘treasure’, by the stone being robbed by the despoilers for building purposes, by early archaeological investigation, by modern disturbance or a combination of all those factors. It appears that the greatest damage to the original structure has been caused by people building temporary shelters and walker’s cairns. Next in the construction sequence was the encircling bank of stones which reaches a width of 2.5 metres and stands 0.7 metres high and is highly visible on aerial photographs as can be seen below. Again the encircling ring has suffered disfiguration, this time due to the slippage of the central mound. During the Bronze Age it was as if there was a competition to see who could build the most prominent and impressive hilltop cairns. Virtually every high point in the vicinity of Knatta Barrow has its own resident cairn none of which are visible from the valley floors. It is only when one gets to the high ground that the cairns erupt from the smooth landscape profile like huge boils – Knatta Barrow being no exception. Back when most of Dartmoor’s produce was transported across the open moors by packsaddle numerous inter-moor routes were established. Amongst these was the ‘Jobbers’ Road’ and is is thought that this track literally passed next to Knatta Barrow. As the barrow is such a prominent landscape feature this would be feasible that it acted as a navigational marker for those travelling across the moor. Not far from Knatta Barrow is Knatta Barrow Pool which is not a natural pool but an old clay extraction pit. At one time both it and the cairn were a favourite spot for the local youths to venture out to. It is here that an old tale about one local lad, ‘Pete the Peat Man‘, is told.